If the three most important rules of real estate are “Location, location, location.” then the rules of billboard advertising (and most advertising for that matter) are “Creative, creative, creative.” You can pick the biggest billboards at the busiest corners, or place ads in the glossiest magazines, but if you’re creative copy fails to hit your target audience with a compelling, interesting, fun message, then your advertising dollars will not generate a return. 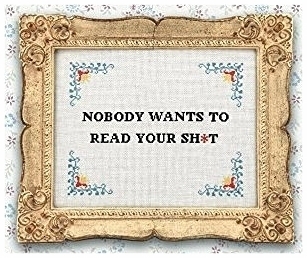 Within our Chicago billboard company, one of our favorite books distills this message into its purest (if most blunt) form in the aptly titled Nobody Wants to Read Your Sh*t by Steven Pressfield. Mr. Pressfield, the author of the The Legend of Bagger Vance and many other novels, began his career as a Madison Avenue copywriter. We don’t claim to be the original Mad Men, but we do consider ourselves experts in outdoor advertising in Chicago. Whether we are working with a realtor in Lincoln Park, a dentist with four offices across Chicago, or a large area hospital, we start from the assumption that people are too busy for your message. If you believe your business and brand are compelling enough that your target audience really should know about you, then we can help you design ad copy that conveys your message in a clear, fun, impactful way.